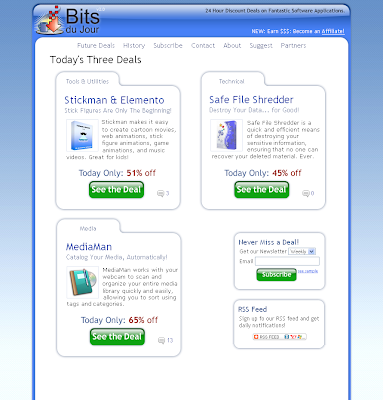 That's right, we're going from two to three deals a day on bitsdujour.com! Starting in December you can now get three huge software discounts every day. To go along with the new deal we're going to be releasing a new homepage design, which we've previewed below. Deals are going to be organized into three channels: "Tools & Utilities" for all those must-have desktop apps, "Technical" for all you nerds and coders out there, and "Media" for the creative audio-visual types. We're giving you this sneak peek at the homepage design to get any last minute feedback that you might have on the design, so please let us know. I like it! I've kinda noticed the software falling into those general categories, and think it's a good idea to differentiate and offer something for each category every day. Well done!